We had a busy carving weekend in February with some lovely work being made. 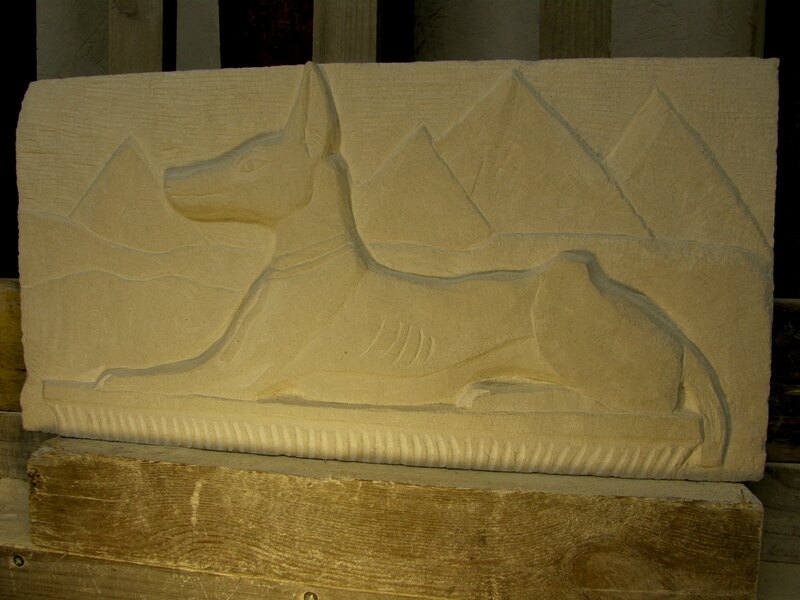 Billie spent four day with us, working on a relief of the Egyptian god Anubis for three days. Billie’s carving is really atmospheric, with a lot of depth and complete with a backdrop of the pyramids. Continuing the canine theme on day four, Billie tackled lettering and completed an inscription of her dog’s name in limestone. All in all a lot of hard work and fun! Over the same weekend, Jonathan made a very pretty snowdrop relief (photo on the students’ gallery) and James returned to finish his house name, which will take pride of place outside his home in Lostwithiel. Other carvers’ work is in progress, watch this space! In early March we visited friends and family in Newcastle and Pete taught for two days at the Mushroom Works arts centre. Returning for his third course was Ian, who has got really into his carving and has completed some excellent lettering work in his own workshop at home. This time, Ian made a relief of an architectural subject, echoing his day job as an architect (photo in the students’ gallery).